Hedge Funds that trade in distressed debt usually have their best years when there is an increase in the corporate bankruptcy rate. When there is an economic downturn, usually there are also more companies in distress. This is when Distressed Debt Hedge Funds take their opportunity to buy assets at very low prices. Their hope is that after restructuring the company will be worth more. The rewards can, of course, be immense when a corporation successfully reorganizes. The big wins are needed however to offset the total losses of some deals. Looking at the past three years we see that in 2013 the bankruptcy rate fell by 24%. The downward trend continued in 2014 with a further decline in bankruptcies of 19%. In 2014 Chapter 11 filings also fell 20%. The economy was expanding, and lower bankruptcy rates and Chapter 11 filings are symptoms of a healthy economy. The picture changed dramatically already in the first quarter of 2015. Q1 of 2015 saw 26 publicly traded companies file for Chapter 11, which was nearly double the number for the same quarter of 2014. It was also the highest number of Chapter 11 filings in 5 years and the largest filings in assets, which totaled $34billion beaten only by the Q1 of 2009 when total assets of companies filing for Chapter 11 reached $102 billion. In July of 2015, the effect of ever lower crude oil and commodity prices began to take its toll. That month alone there were 637 filings under Chapter 11 an increase of 77% compared to the same month in 2014. Most of the filings were driven by the energy sector as the price of crude slumped below $50 a barrel. 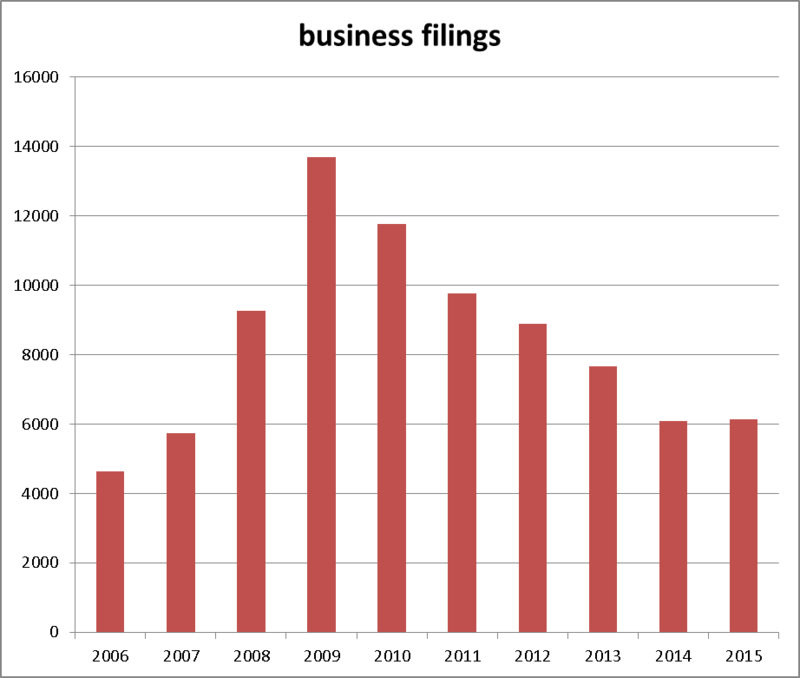 The chart below shows how total Chapter 11 business filings have stopped falling after 5 consecutive years of reductions. In 2015, there was a small increase of 37 filings compared to 2014. However, the turn back up has happened at a level still well above the pre-subprime crisis of 2007. This seems just like the fertile ground that a distressed debt investor needs to take advantage of these deals. There are various Hedge Funds that trade in distressed debt as their primary mandate. Hedge Funds will access exposure to distressed debt via acquisition to a company’s bonds or through the provision of a credit line once the company has filed for Chapter 11. Bonds are more attractive than a company’s equity as they are higher up in line, they have higher seniority if the company is liquidated. As well as companies already under the protection of Chapter 11, Hedge Funds may look at companies that although in distress have not yet filed for protection. These bonds will be very close to the price of the bonds of a company that has filed for Chapter 11, yet the fund may see it has better chances than others in turning its situation around. When a company exits Chapter 11 or recovers from a distressed situation, it is usually a viable firm with a once again profitable business. Under this scenario, its assets regain a considerable amount of value. Funds will hold bonds in various companies as dilution of its exposure to any single company mitigates overall risk. Another way is for Hedge Funds to extend credit lines to companies that have already filed for Chapter 11 protection. Loans issued to corporates under this restructuring process have a higher seniority than other debt issued before filing for Chapter 11; that is to say, they receive priority of payment if the company is liquidated. First of all, you need to identify corporations that have filed for Chapter 11 or are struggling with their debt burden. So it is easy to learn about larger publically traded companies as their filings will often appear in the news, if not you can always browse the internet. If a filing hasn’t been made, you can usually get insight as to how distressed a company’s debt is by looking at its bond ratings from agencies like Standard & Poor’s or Moody’s. Sometimes companies have a decent clientele and marketable product, but may be suffering from poor corporate governance and cash flow shortage. Identifying the right target can bring considerable rewards, always when you have enough stamina for risk and patience in the search. The way to access exposure to these corporates is through their bond issuance like Hedge Funds do. Make sure the bond issued has a high level of seniority and is not a subordinated issue or mezzanine debt. You will also need to consider recovery rates and how to diversify your portfolio of distressed debt, which might mean the help of an investment advisor.